Kashmir is a valley in the Himalayan Mountains with a rich and ancient heritage of craftsmanship. 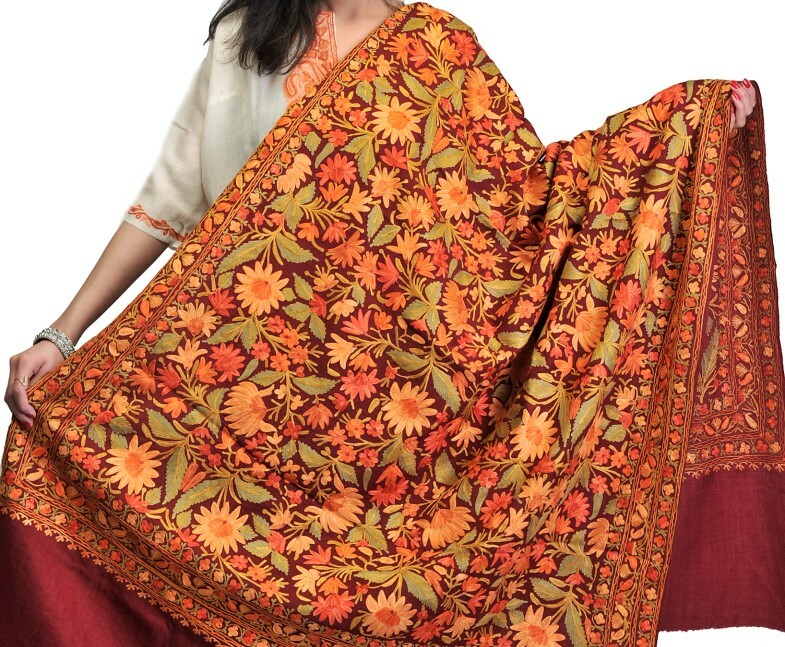 Pashmina refers to a type of cashmere wool made from it. The name comes from Pasmineh originate from the Persian word for wool pashm . This wool comes from changthangi or ladakh or pashmina goat, a special breed of goat indigenous to high altitude of the Himalayas. The high Himalayas has a harsh, cold climate and the goats , who have developed an exceptionally warm fine light fibre coat, shed their winter coat every spring and the fleece is caught on thorn bushes. Villagers would scour the mountainside for the finest fleece to be used. The origin of shawls in the world can be traced back more than 700 years. However it has not been confirmed as to when and where the first shawl was made and in fact by whom. It was Zain-Ul-Ahadin in mid 14th century who introduced the art of weaving in the Kashmir valley. The Embroidered shawl was the creation of a peasant called Ali Baba. 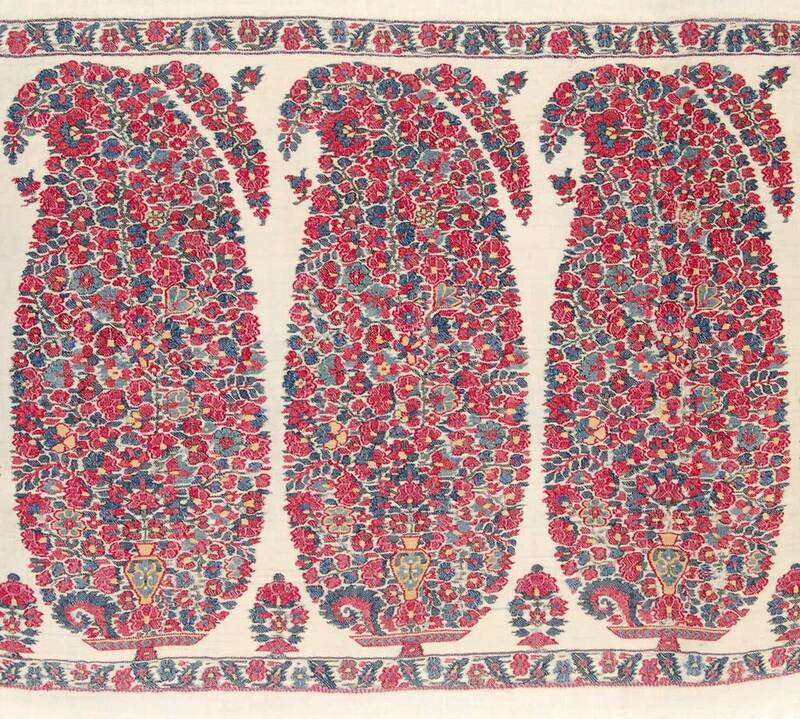 Allegedly Ali Baba once noticed the imprint of a fowl's feet left on a white sheet and he proceeded to embroider the outline with coloured thread to enhance the effect and that is how the embroidered shawls were introduced. Silk and cotton thread is used for embroidery. The artisan has to twist the raw silk until it fits the eye of the needle. The workmanship is so intricate and time consuming that some embroidered shawls take 2 to 4 years time to complete. promoted the manufacture of shawls in Kashmir. He also presented a gift of Kashmir jamawar shawl to the Queen of England. Fabrics Bernier description of shawls in the late 17th Century, leaves us in no doubt that he is referring to the same pashmina shawls that became famous as Kashmir (Cashmere) Shawls. It became a highly fashionable and stylish garment when Empress Josephine famously received Kashmir shawls as gifts from Napoleon. The shawls became a favoured item in the wardrobe of every fashionable woman in Europe, particularly in France. The Industry flourished during this period. The Industry suffered through the reign of Afghan and then Sikh rule. This was a period in Kashmir history where there was a marked decline in crafts. However, in the late 18th Century during the reign of Maharaja Ranbir Singh, the trade picked up. 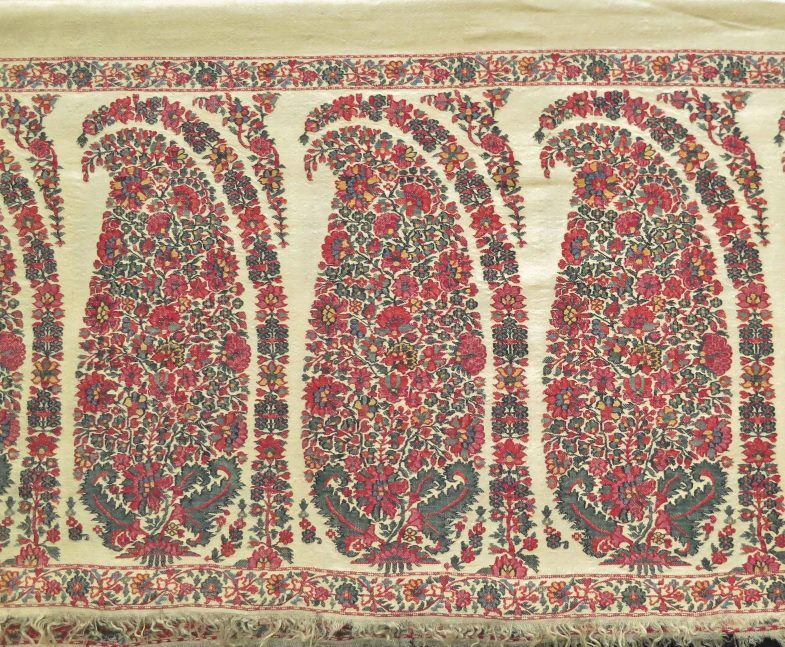 In the early 19th Century the shawl exhibitions in the European market helped to create awareness and promote Kashmir shawls again throughout the world.